Off to get some Kielbasy! Yesterday, My girlfriend, Toni, and I traveled to Shenadoah, PA to get some fresh Kielbasy. Here is the site www.kielbasy.net/. It was a beautiful ride up in the mountains. The town is a neat town in the Pennsylvania mountains. The houses are built into the mountains. We saw those great big wind turbines. They are lined up on the mountain ridges. We saw some that were lower – still high though – and it was so impressive!. So we went to Kowalonek’s to get fresh Kielbasy. There were so many people in the store, we couldn’t believe it! We got number 48 and 49. They were on #20. We walked around the inside of the store and got some rye bread, nut rolls, pierogies, and Kielbasy dip while we waited. The people waiting were very friendly and were calm about waiting. Our numbers came up faster than we thought. There were many people working there and they were very helpful. I got 8 fresh Kielbasy sausages, 1 lb. Krowkaska lunchmeat, 1 smoked Kielbasy sausage, 4 jars red beet horseradish, and 1 jar white horseradish. Toni got some sausages and nut rolls. We asked the people waiting if there were any bakeries in town and they gave us directions. Everyone was so nice! As we left, the line was now out the door into the parking lot. We got in our car and went to the bakery, It was in a house and the ladies there were very nice and helpful. I got iced raisin bread, some pastries, and directions to a good local restaurant to eat. We went to the restaurant. It was called Dutch Kitchen and was very nice. We had a cup of potato soup and the salad bar. The waitress was very nice. Then we headed home. It was a great day! We had a beautiful ride in the mountains, caught up on what me and my high school friend have been doing, met some friendly people, and got some very good Kielbasy and baked goods. 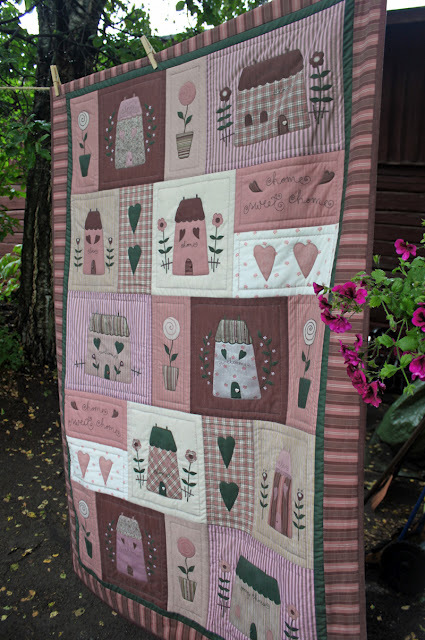 I have been looking at quilting sites and blogs and I have found a great blog! Her blog is http://quiltworld2.blogspot.com/ and her name is Ulla. She is from Finland. Her work is beautiful and so well done!. Take a look at her craftsmanship and let me know what you think. The lady has so much talent!